"I am the first of my nine siblings to earn my college degree. Simpson University has made it possible for me to accomplish this dream, and I’m so thankful for that. Being a full-time accountant assistant, a full-time mom and wife, my dream of getting a higher education was on hold. Then I learned that Simpson’s ASPIRE program offered great flexibility in classroom and study hours. "I am the first of my nine siblings to earn my college degree. 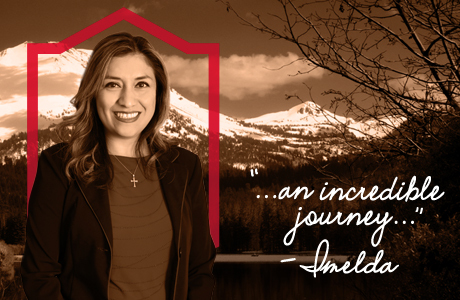 Simpson University has made it possible for me to accomplish this dream, and I’m so thankful for that." When I realized I could finally get my B.A., financial aid to help pay for some of it, and have the help of great staff and professors, that sealed the deal. I enrolled in the Business Management program. My degree is preparing me for a better future. I can feel confident to apply for a manager’s position. I am knowledgeable about how to run a business from start to finish. I am aware of financial functions, marketing, accountability, and how to deal with employees and customers. Being a student has been an incredible journey. Not only am I getting the best education, I’ve also made some new, lifelong friends at Simpson. They have become an extension of my family. This has really been a spiritual journey – you learn to be successful in life, and your life is enriched by the people you share the experience with. I love it and would recommend the program for full-time employees who put their education on hold because of time and money constraints; for single parents who want to provide a better future for their children; and most of all, for moms like that who still want to spend time with their family while going to school and working.